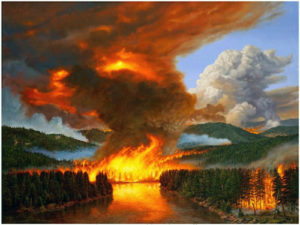 Western Fires by Artist John Moffitt. 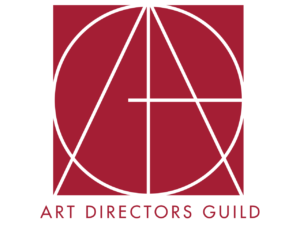 The ART DIRECTORS GUILD GALLERY 800 (ADG, IATSE Local 800) is proud to present, Little Bonfires (In Boundaried Spaces), a special mixed media art exhibit featuring over 30 artists, including guild members of the Production Designers, Art Directors, Artists, Illustrators, Set Designers and others who work in the motion picture and television industries. Opening with a reception on Saturday, April 28, 2018 from 5pm to 8pm, the exhibit will run through July 7, held at the Historic Lankershim Arts Center at 5108 Lankershim Blvd., in North Hollywood, CA. BAFTA nominated artist, Brian Eatwell, perhaps best known for his work on The Abominable Dr. Phibes,The Man Who Fell to Earth,The Three Musketeers, The Four Musketeers and Wired) and Emmy nominated Art Director, John V. Cartwright, whose projects include An Officer and A Gentleman, The Winds of War, First Monday in October, and Kiss Me Goodbye, will have their artwork spotlighted at the show along with Cartwright’s daughter and featured guest artist, Angela Cartwright, known for her disparate roles in The Sound of Music, “Lost In Space,” “Alfred Hitchcock Presents,” and Logan’s Run, among many others. Artists such as Christine Bingham, Katie Bode, Chris Brandt, Francisco Del Mar, Thomas DeVoss, Pierre Dotman, Barbara Dunphy, Bridget Duffy, James Faulkner, Thomas Frohling, Pete Graziano, Robert Kalafut, Cathie Koon, Kenneth Larson, Cesar Lemus, Krystyna Loboda, Kim Lyons, Barbara Mesney, Robin McCarthy, John Moffitt, Dan Ouellette, Stasys Pinkus, Rhea Rebbe, Roberto Rios, May Routh, Jeff Skrimstad, Catherine Wall and Martin Whist will also be showing their art work, including installations.